Harvest of the Month: Cucumbers! October 26th, students and staff will sample "Thai Cucumber Salad" during their lunchtime taste tests. The cucumbers are locally grown by farmers at the Fayetteville Farmers Market. Have you heard the phrase "cool as a cucumber"? 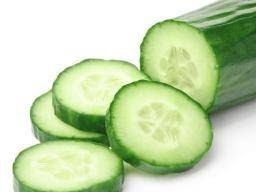 Cucumbers can cool the temperature of your blood and reduce swelling when you put them on your skin! If students or staff like the recipe it can be found on our Seed to Student Facebook page, our Child Nutrition Department website, or at this link. The recipe was also sent home to families via PeachJar.